This is something nice to read from a foreign publication. A US magazine, International Living rated Malaysia's healthcare system as the third best out of 24 countries in its 2014 Global Retirement Index. It also mentioned that Malaysia is Asia's best place to retire. Go ahead, read it! This prompted our prime minister Datuk Seri Najib Tun Razak to tweet saying Malaysia should be proud as its healthcare system is one of the best in the world. PM Najib: "Malaysia scores third best out of 24 countries in International Living's Annual Global Retirement Index 2014. We should be proud!" A study by the American publication, International Living, rates Malaysia's healthcare system as the third best out of 24 countries in its 2014 Global Retirement Index, beating Spain, Italy, Ireland and New Zealand, among other countries. Malaysia was listed as third place after it scored 95 out of a possible 100 points. The top two countries, France and Uruguay, scored 97 and 96 points respectively. The index, which was recently released by the Baltimore-based magazine, praised Malaysia's healthcare as the medical expertise of Malaysian healthcare practitioners is equal to or better than what it is in most Western countries. 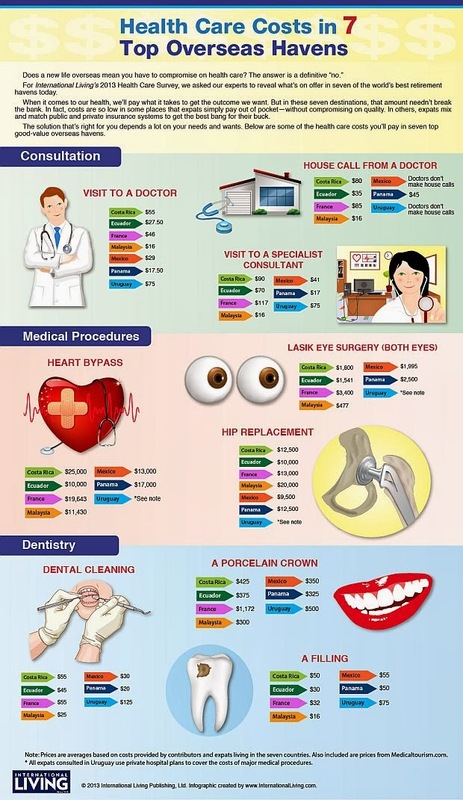 In its previous publication, International Living provided the following infographic to compare the Healthcare Costs in 7 Top Oversea Havens. Really, compared to other places with similarly world-class equipment, medical care in Malaysia is "a bargain" as some expats described it. TheGreenMechanics: You should be proud. A little, if you like. Although you may complain once in a while (ahem.., infact too much at times).